We've come across some talented musicians in our time, but Dresden's "Court of Water" is the first one we've seen that is a wall. 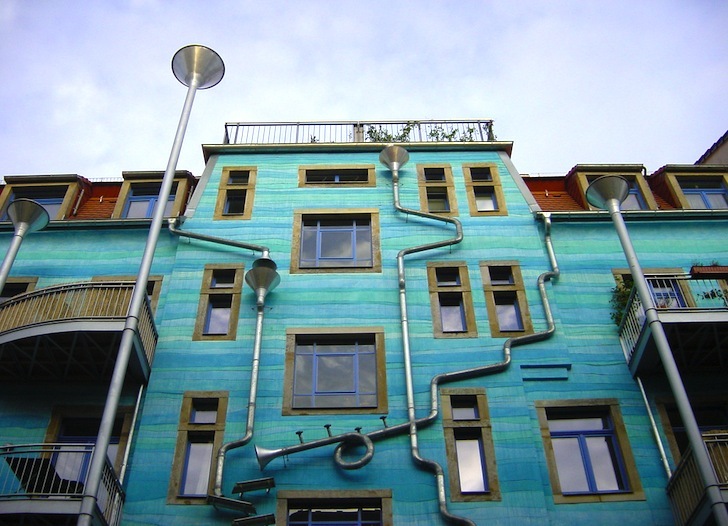 Designed by Heike Bottcher in 1999 for Dresden's Kunsthof Passage farm collective, the Court of Water features a fascinating array of funnels and tubes that create hydro music when the rain comes pouring down. This playful marriage of art and architecture has made this quaint corner of the city a coveted destination at all times of the year. Hit the jump to see a video of what it sounds like. Artists Annette Paul, Christopher Rossner, and Andre Temple took inspiration from St. Petersburg’s Rainy Theater, although the installation in Dresden is very different. The blue and green painted facade is interspersed with an unusual collection of crazy metal downspouts that lend a certain auditory art to a small recreational and shopping area. Other installations include the Court of Mythical Creatures and the Court of Metamorphosis. Despite having suffered serious losses during World War II, this small German city owes its reputation as one of Europe’s most environmentally progressive to its three natural reserves and the fact that more than 60% of its urban area is covered in green spaces. It is also sometimes referred to as the Jewel Box as a result of its astonishing collection of Baroque and Rococo architecture. As for the singing wall, we hope it brightened up your day as it did ours. I didn't hear any music in the video. Are you sure it actually makes music? Originally designed in 1999, it still attracts visitors to this corner of Dresden at all times of year - especially when it's rainy! This is another building designed in the district by Heike Bottcher in 1999!